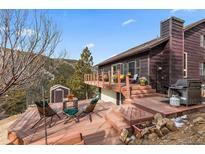 Find Idaho Springs, CO Homes for sale. View Photos, Maps and MLS Data Now! *Showings begin on Saturday April 20th – Great Investment Opportunity *This Home is a Must See! MLS#8504570. RE/MAX PROFESSIONALS. Don't miss this rare opportunity! MLS#5314830. HomeSmart Cherry Creek. Winterland - Enjoy all that St. Mary's has to offer: hiking, fishing, dirt biking, ATVing...St. Mary's provides the perfect outdoor setting. MLS#3599566. Keller Williams Preferred Realty. Storage shed is the perfect size to fit a 4 wheeler, or any of your other toys. MLS#6462524. Keller Williams Advantage Realty LLC. Fall River - This clean, well kept and updated home shows pride of ownership. Schedule your showing today. MLS#5813997. Berkshire Hathaway HomeServices Elevated Living RE. This beautiful three bedroom, two full bath home has been updated with custom cabinets, quartz counters, new fixtures, new paint, new carpet, new durable laminate flooring that looks like hardwoods, new windows, new appliances, new composition shingle roof (metal roofing was existing), and a new septic septic system that is being installed at this time, completion expected the end of March, pending on weather (water is turned off until septic is complete). Detached two car garage. MLS#2608933. Precision Homes Real Estate. Enjoy all that St. Mary's has to offer: hiking, fishing, dirt biking, ATVing...St. Mary's provides the perfect outdoor setting. 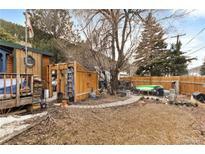 MLS#7759335. Keller Williams Preferred Realty. Utility shed plus detached workshop. Bring your imagination! MLS#9444336. COLORADO HOMESCAPES LLC. There is even a handcrafted outdoor fireplace. MLS#8142635. Ion Real Estate Inc..
Winterland - The home next door is listing #8652993. Interior Photos coming soon. MLS#9693089. 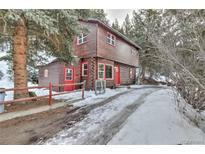 Brokers Guild-Cherry Creek Ltd..
Winterland - The owners home next door is a large, custom log home on the lake. MLS#8652993. Brokers Guild-Cherry Creek Ltd.. Almost all custom furniture is included with this home. Your paradise awaits. MLS#7769920. COLDWELL BANKER RES BROKERAGE. Blue Valley Acres - Easy access to Evergreen & Idaho Springs, a quick 15-20 minutes, Please contact the Listing Agent, for more details. MLS#4924579. RE/MAX ALLIANCE. One unit is vacant and the other is owner-occupied. 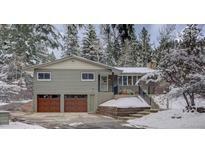 MLS#3242178. Keller Williams Advantage Realty LLC.